This one has been sitting in my drafts folder for months, but Hausmann just got me thinking about it again. "Meze Fresh" is probably one of the best places to eat in Kigali. Certainly one of the fastest. It's a Chipotle-style Mexican place, with a range of salads, meats, salsas, and sauces in a bar at the front that are thrown together in a tortilla in no time at all. Plus they do margaritas. The owner, I'm told, is a young American guy in his 20s who worked in a Chipotle back home in California, and basically borrowed the entire concept and replicated it here. A similar thing is going on with the Office, or with the young Americans in Kigali setting up their own gyms and solar energy businesses. To some extent, that is what development is. Borrowing ideas. At least that's what catch-up growth is. At the world technological frontier you need to invent new ideas to get economic growth, but for most developing countries you can get a long way just copying other ideas. Hausmann's point is that it takes people to transfer ideas, because it's really hard to teach people things that depend upon learning by doing. Which resonates with the experience of all these expats in Kigali who came to do traditional aid work, decided they liked living there, and started spotting all these business opportunities based on ideas from back home. The policy implications of this? For developing countries, one is to make it really easy for people to come visit and live in your country. Rwanda is doing this. The kind of bureaucracy and visa fees you find in many other countries is just incredibly short-sighted. 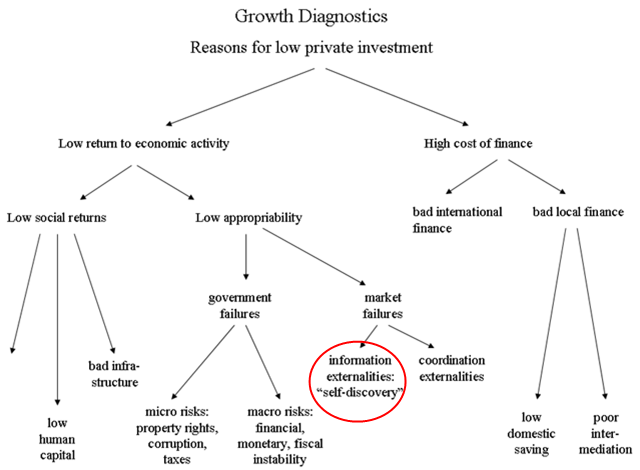 I'm also reminded of another Hausmann contribution - growth diagnostics. In a place like Rwanda, having got the basics of physical security, macroeconomic stability, decent government administration, and infrastructure under control, one of the things that might start to bind as a constraint to growth is "information externalities." Any suggestions for what any of this implies for donor policy? Can we and would we want to increase subsidies for foreign investment?